Is humanity too dumb for its own good? Though the question may be seen as facetious, the reality is that we as a species in evolutionary years are relatively young. In cognitive terms, we are little different from early homo sapiens who shared Eurasia with Neanderthals up until 30,000 years ago. Simply put, we could pluck a human being at any point in our species' history, transport them to modern day, and with education have them function no differently than anyone else born in the past century. And that may be the problem. 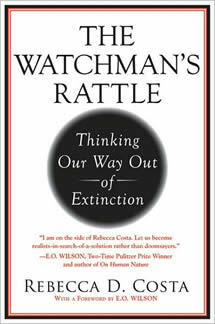 According to Rebecca Costa's The Watchman's Rattle: Thinking Our Way Out of Extinction, humanity is facing extraordinarily multifaceted problems similar to ones that brought down past empires and that we're as unable to grapple with these issues as the Mayans and Romans before us. The world continues to grow more complex but our brains have failed to keep pace. We reach what Costa refers to as a cognitive threshold, where "[t]he rate of uneven change between the slow evolution of human biology and the rapid rate at which societies advance eventually causes progress to come to a standstill." Costa argues that when faced with this problem, past societies have fallen into predictable patterns. Irrational belief began to take the place of rational solutions and eventually the societies collapsed because the mitigating strategies they employed to deal with their problems became overwhelmed by the growing systemic problems. Costa argues that modern society too is beginning to use strategies to deny humanity's common problems. She calls them "supermemes" and they consist of oppositional behaviour over focus on problem solving, ensuring someone gets the blame when solutions don't work out as planned, favouring ill-conceived assumptions over facts, the compartmentalization of knowledge and behaviour which makes collaborative problem solving difficult and a worship of economic principles over all other considerations. Costa's argument is an interesting one – it doesn't take much evidence to prove that we're turning into a world of gridlock and that, to employ one of Costa's own examples, grand achievements like democracy's victory over fascism during the Second World War would be impossible today. The community spirit of post-9/11 America wasn't undone by the 2003 Iraq War as many would have today, it almost immediately began to unravel as the debate to the response began. Most Americans were united by the non-political agenda as the heroes of September 11, 2001 were celebrated, but as the war against terrorism began in earnest, the popularity of the struggle began to slowly disappear as debate over what should be done, and even whether something should be done. Though it doesn't kill her effort, it's fairly clear where Costa's political beliefs lie. In fact, one could probably develop a drinking game based on the number of times she brings up climate change as one of those problems humanity seems unable to resolve. To be fair, she does seem reasonable on issues and doesn't evangelize in favour of her beliefs so The Watchman's Rattle doesn't become a Trojan Horse for an agenda. Still, Costa could be accused of being concerned about problems that are hardly systemic in nature. Is terrorism, which she also lists, really a civilizational crisis that threatens our collapse? Costa also unfortunately wraps her effort up with some New Age-y nonsense about how to develop "insight" in order for humanity to deal with its collective problems. Given that the entire crux of her argument is that our brains have failed to keep up with the growing complexity of our world, and that this is an evolutionary issue – that is, the problem lies at the level of our genes – a reader could be forgiven for wondering exactly how Costa's prescriptions would ameliorate the problem. In fact, given that society will only keep getting more complex, it's debatable whether there's any solution at all. If Costa is right, humanity is doomed until a new homo evolves. Although this review is being critical of The Watchman's Rattle, it must be noted that there is much in it to recommend. If anything, simply posing the question of what causes successful societies to collapse is a necessary one given the thin technological threads that holds ours together. And although one can find much at fault with Costa's central thesis and her accompanying prescriptions, the voices of sociobiologists deserves to be included in a debate dominated by historians. Steven Martinovich is the editor-in-chief of Enter Stage Right.